If it's one thing I like to treat myself to, it's a Lush face mask. After running out of their amazing Cup O' Coffee exfoliating mask recently, I was on the hunt for something new to try. As we're on the cusp of spring, I fancied something re-energising and fresh. One of the lovely staff at the Hull branch pointed me in the direction of the fresh face mask section. You know, the bit where there're all the ice and the cute bowls of products that look good enough to eat? I don't really have a 'type' of skin. I'm lucky to say that I never suffer badly with acne or dry skin unless I'm super stressed or run down. With this in mind, I asked them which would be the best for a quick 'pick-me-up' when my skin is looking a bit dull. The guy told me that Brazened Honey was the perfect solution. He'd used it during his time at university when he was feeling sluggish and tired. The yellow paste is full of honey, fresh fruits, herbs and spices as well as ground almonds to act as an exfoliant. This was music to my ears. I had recently been chatting to artist Mandy Baker, who creates beautiful art out of plastic marine debris. I was so shocked to hear that the microbeads found in many modern-day scrubs were actually plastic. They get washed away into the sea and the fish and microplankton eat and absorb them. How nasty? Being quite eco-conscious, and quite fond of marine conservation (I was once going to be a marine biologist, y'anno), I was horrified. Luckily, a lot of what I use in the shower is from Lush as I fell in love with their face masks a long time ago. However, now I'm checking all sorts of labels on my products and have even swapped to using solid shampoo/conditioner when I can - a story for another day. So, how does this mask make my skin feel? I usually pop it on once a week, before I do anything else in the bath or shower. They say leave it on for 5-10 minutes but I always end up going over that time, especially when I'm in the bath. The mask doesn't take long to set, which I personally love the feeling of. I like to twitch my nose and mouth whilst it's on - does anyone else do this when they wear face masks? It's so satisfying. Brazened Honey smells incredible. A combination of honey and lemon with a kick of spices like ginger, rosemary and turmeric. I'm really getting into the power of aromatherapy at the moment and this mask just makes me feel relaxed after a busy day at work. It should be noted that this mask does have egg in it, so not great if you're a vegan. And, of course, those who are allergic to nuts can't use this either. When I wash a Lush face mask off my face, I usually massage it in like an exfoliant to make the most of the product. Afterwards, my face feels glowy, vibrant and fresh. I'd definitely recommend this mask. The only thing that is annoying is that you have to keep it in the fridge because that means I have to remember it before I head to the bathroom. However, it's the price I'll pay for having fresh ingredients in my facemask. It also means that it's super cold and refreshing when you first apply it, especially if you're enjoying a hot bath. What's your favourite Lush product? And how do you relax after a long week? Let me know in the comments or Tweet me. 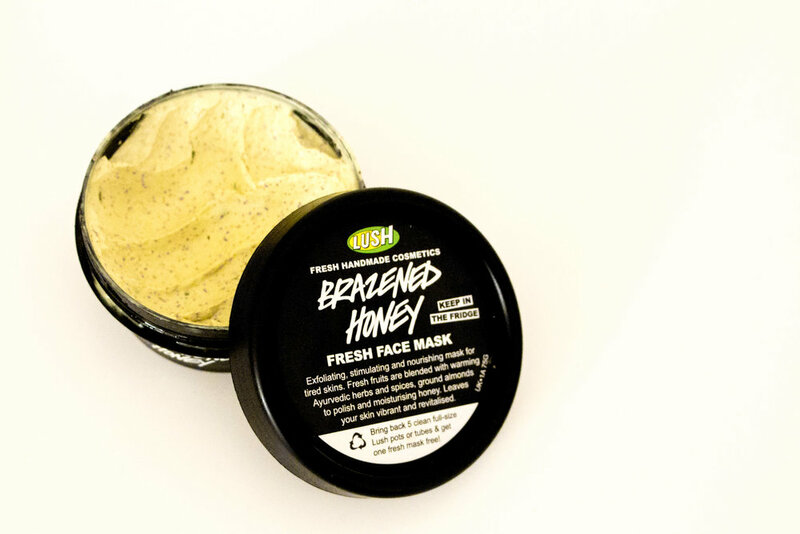 Brazened Honey is £7.95 a pot. This post wasn't sponsored, I just wanted to share something that I've been loving recently.